Tanisha Brown is a longtime college basketball fan — she started watching with her dad growing up. When she began attending Pitt, the Panthers quickly earned a place in her heart and her presence at the Petersen Events Center. 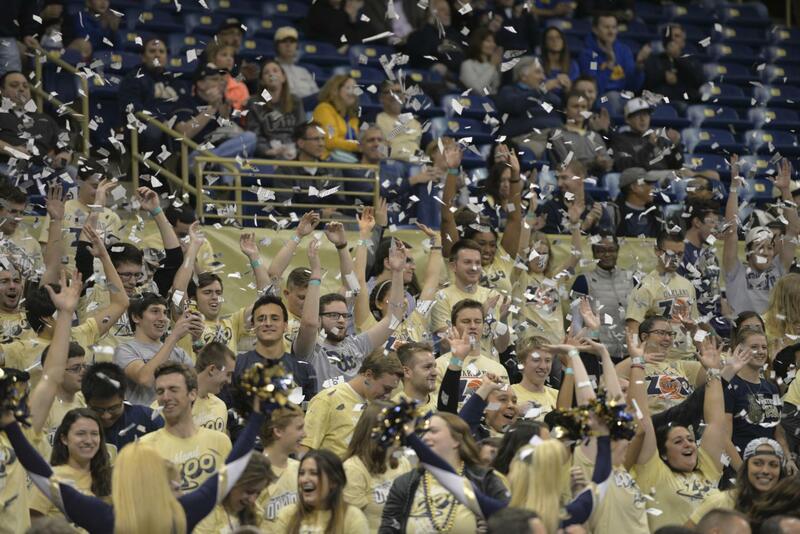 There has been a steady drop in attendance at Pitt men’s basketball games over the last four seasons. After the 2012-2013 season, the ticketing office said the attendance averaged about 10,200 per game. Last season, however, the Petersen averaged about 8,300 fans per game. Ben Smith, the assistant athletic director of ticketing at Pitt, said he thinks this trend is not just a Pitt problem, but a nationwide one. He partially attributes this trend to the ease of viewing games. Though nationwide attendance has been steadily going down, Pitt’s 18.6 percent drop is much higher than the 4 percent drop seen on average across the country’s Division I schools like Duke and Baylor between 2013 and 2017. Though he said it wasn’t the entire reason, Smith cited the performance of the team last year — 16 wins and 17 losses — as having an impact on the numbers. “Maybe fans didn’t really see the effort on the floor that they wanted to,” he said. Panther fan Derek Sellers, a junior chemical engineering major, said he was disappointed watching the last season, especially since he had high expectations for the team going into the year. He is trying to feel more optimistic now that the new coach, Kevin Stallings, has spent more time getting to know the players on the team and bring in new ones. According to Smith, a drop in attendance at any athletic game does hurt finances, but the athletic department can draw from revenue from another sport when one is underperforming. For example, he said the athletic department is able to lean on ticket sales and profits of the football team during times when the turnout for men’s basketball is low. Losing longtime season ticket holders for men’s basketball is a major factor in why the attendance is lower these last few years, according to Smith. Other entertainment opportunities in the city, such as other professional sports teams, may be drawing people away. But he said they are trying to focus on the opportunities it has opened up. “While it is a disappointment to lose some of those longtime season ticket holders, having available seats also allows us to market and cater to a group of fans that maybe we haven’t been able to before,” he said. Smith outlined a few changes the athletic department is implementing to win back the fans they lost in recent years that will be implemented in the future.. Prices will be lowered in an effort to increase sales and make the games more affordable. The department will also be offering new ticket packages, single-game tickets and group purchases of tickets for the lower level of the Pete. The department is also considering changing some purchasing procedures, such as when tickets go on sale. “While we are down in attendance with the general public, it does allow us to kind of market our product to a group of individuals that are our future donors and future season ticket holders,” Smith said. The athletic department is also looking into ways to attract students to attend some of the less popular games, according to Smith. For example, the first 500 students in the doors at some of the less games will receive better seats for more popular games like Duke, West Virginia and Syracuse. Sellers said the Oakland Zoo executive board is also looking to drive up student attendance at basketball games. As one of the vice presidents of the student cheering section’s board, he said the Zoo is taking additional measures to raise interest among its peers, including looking to involve players in videos for their social media page. Brown said although her senior year schedule is her busiest yet, she hopes to attend some games this season. She is staying positive with her prediction for this season.